Simon Manyara is the Access To Medicines manager for Boehringer Ingelheim, sub-Saharan Africa. As part of his responsibilities, Simon has oversight of Boehringer Ingelheim’s social business initiatives under the innovative Making More Health initiative. Through this initiative, Boehringer Ingelheim has partnered with Ashoka to co-create holistic and sustainable solutions to healthcare by working together with social entrepreneurs. Prior to joining Boehringer Ingelheim, Simon led the implementation of various projects focusing on access to medicines and affordable healthcare in rural western Kenya. 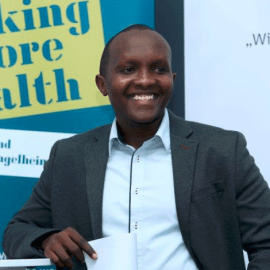 Simon holds a Bachelor of Pharmacy degree from the University of Nairobi and a Master’s degree in Global Health from the University of Edinburgh. Simon is passionate about sustainable healthcare delivery and disruptive innovation.